This is one of four reports from the Beyond Abuse project. This document is the report from Brighton and Hove. 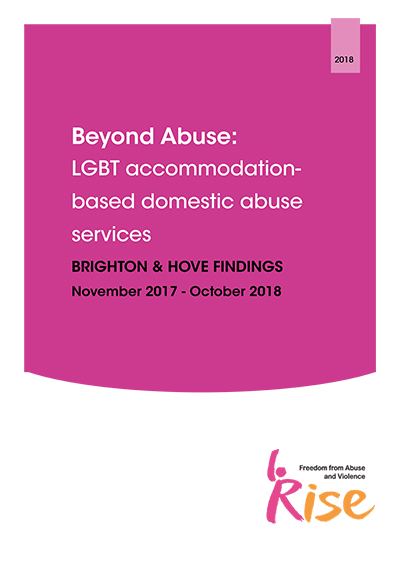 As part of the Beyond Abuse- LGBT (Lesbian, Gay, Bisexual and Trans) accommodation based domestic abuse services, RISE have been providing a support service within the Brighton and Hove area. Similar projects were funded in the Greater Manchester Area and the in the London Borough of Hammersmith & Fulham. LGBT Foundation and Stonewall Housing provided these services. Due to all running similar projects through the same funder, a national partnership was formed between all three agencies. Locally, RISE partnered with Southdown Housing and were supported in furnishing the refuge flats by Sussex Beacon.